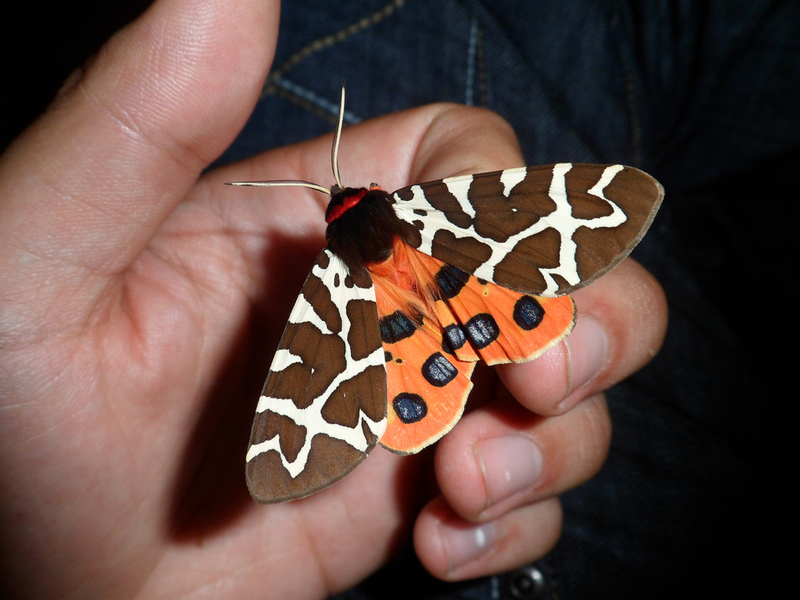 Arctia caja — “Garden tiger moth” | Welcome, visitor! 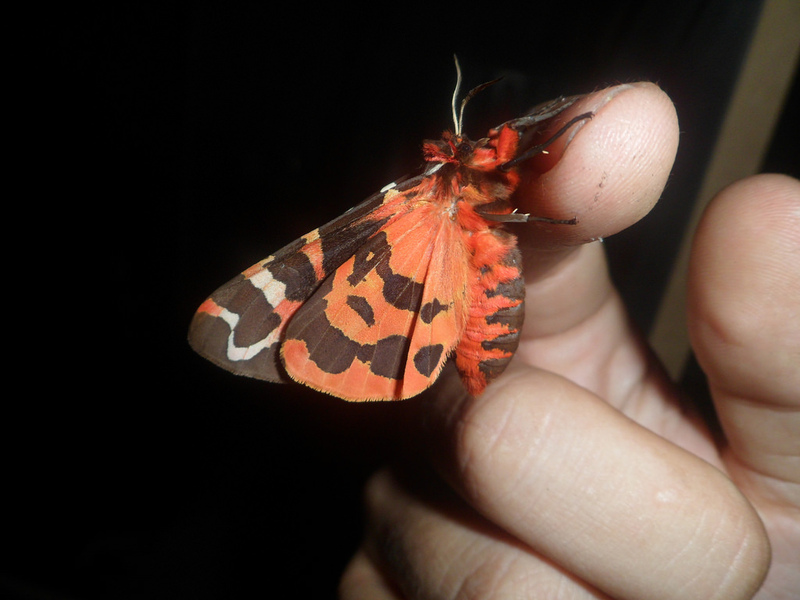 Arctia caja, also know as the “garden tiger moth” is one of the Arctiidae moths with the widest distribution in the Palearctic realm and can be found in large parts of the world including Europe, Asia, Russia and North-America. Is it a highly variable moth; each individual has different looking spots on the wings – this means each individual is unique looking! The shade of colour of the hindwings and colour of spots on the forewings also varies. The bright red hindwings of this moth serve as an aposematic warning, as the bodily fluids of this moth contain neurotoxin that may afflict potential predators that eat them. When resting, the hindwings are hidden beneath the forewings. Whenever stressed or disturbed, they will spread their wings and flash their red hindwings as a scare tactic and also a fair warning. They may also shrug their wings to make a “clicking” noise and secrete a bitter-tasting substance in order to be less palatable for predators. Some birds have been observed to eat these moths – but only in small amounts, to minimize the effects of the toxins. The caterpillars of Arctia caja devouring the flowers of Taxaracum sp. 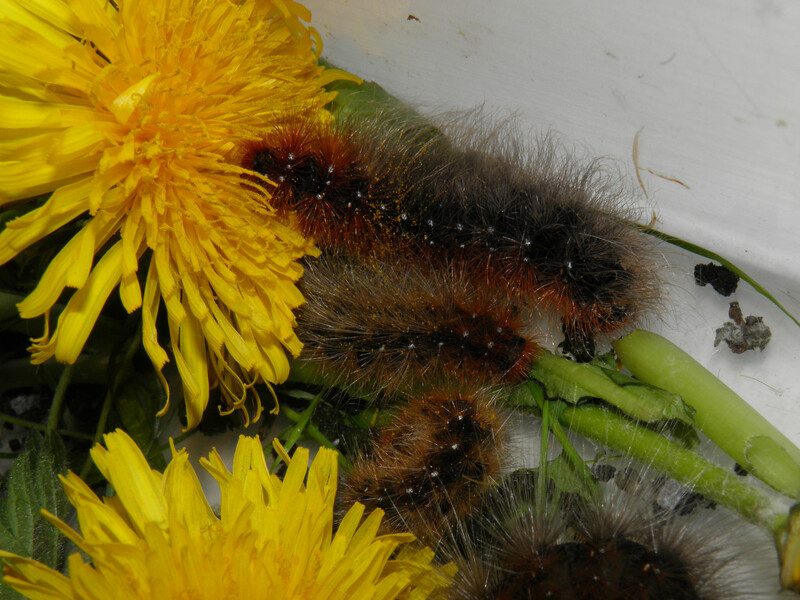 Like typical Arctiids (=tiger moths) the caterpillars are hairy in appearance. Their furry tufts of hair provide protection against cold which is useful, as this species overwinters as caterpillar. They also serve to make the caterpillar unpalatable, as hairs are both hard to digest and swallow and some of the hairs also contain formic acid which may cause irratation. Instead of limiting themselves to a single host plant, the caterpillars are highly polyphagous and will feed from a wide range and mix of plants, usually low growing plants. Some examples include Taraxacum (dandelions), Plantago (plantains), Rubus (blackberries), Prunus (cherries), Trifolium (clovers) and many more. In captivity, experimenting with host plant will be worthwhile. A whole life cycle, in the palm of my hand.. Notable is the highly variable individual growth rate. From the same clutch of eggs, individuals may develop as moths and reproduce, their offspring being able to catch up with caterpillars from their parental generation, that have not yet developed to adults. This picture illustrates a caterpillar, pupa and moth from the same batch of eggs. It is unusual for a single generation of moths from the same parent to remain in different stages of development. This species doesn’t put much effort into making a cocoon, which usually consists of some loose threads covered with hairs that the caterpillar has shed. They like to incorporate objects such as leaf litter (or in captivity paper towel) into their cocoons. In captivity these moths are quite easy to rear and breed. 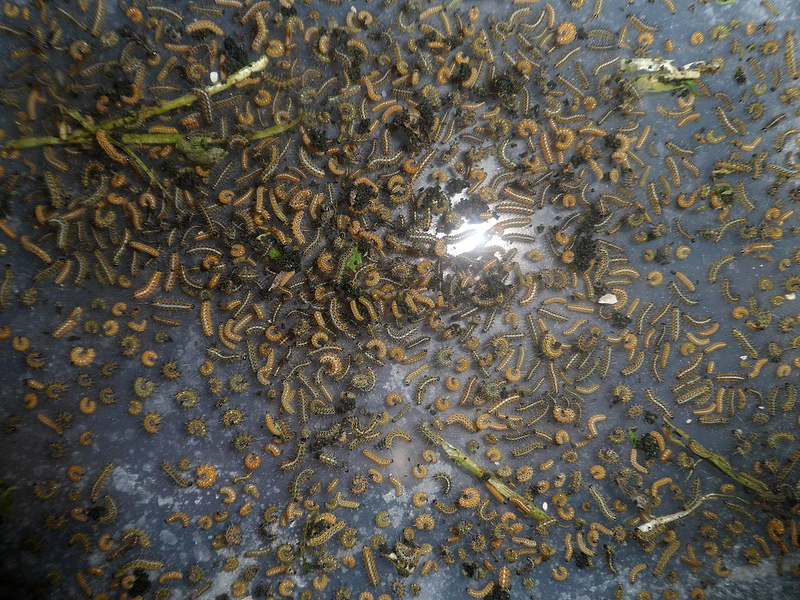 The caterpillars can be reared in relatively high density on room temperature. I recommend feeding a mix of Taraxacum and Plantago. Pupae do not diapause as this species overwinters as caterpillar. Can also be bred in winter. Eggs are laid in large patches, and when fertilised, will hatch quite fast. Caterpillars spend their lives on the floor, they don’t tend to stick to their food plant but rather scavenge on the ground. So hygiene is an important factor, because this means they will dwell between their own feces if not properly cleaned. Hey! Great website! 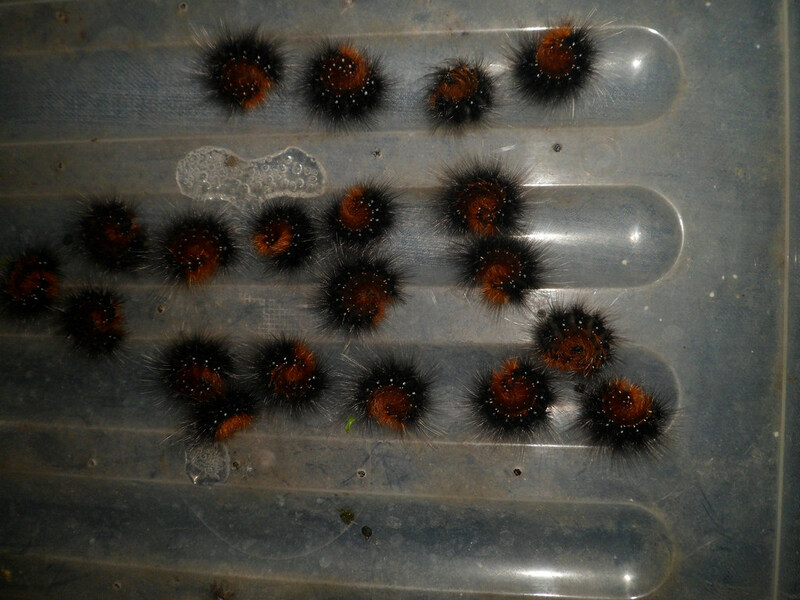 I have now a dozens of Arctia Caja caterpillar, I’m giving them Taraxacum but they don’t eat at all, neither they produce excrements. How can I do??? Any tips? How odd, perhaps they are trying to overwinter, many Arctiidae have low metabolism in winter since they survive as young caterpillars..although they still eat during this time, but minimally so. How are they doing? Now all the caterpillars are dead but two that started feeding and growing. Always reared between 19°-20° C, maybe all the dead simply didn’t like taraxacum as they were reared on mallow before, from the first breeder. I have an invasion (1000s)of these in a greenhouse I have shut down for the season. They are also in the grass & on the walkways outside of it. I’m afraid they will spread to my greenhouse that I am currently growing in and devour my crops. Can this be prevented? Do they run some kind of cycle of overproduction every few years? 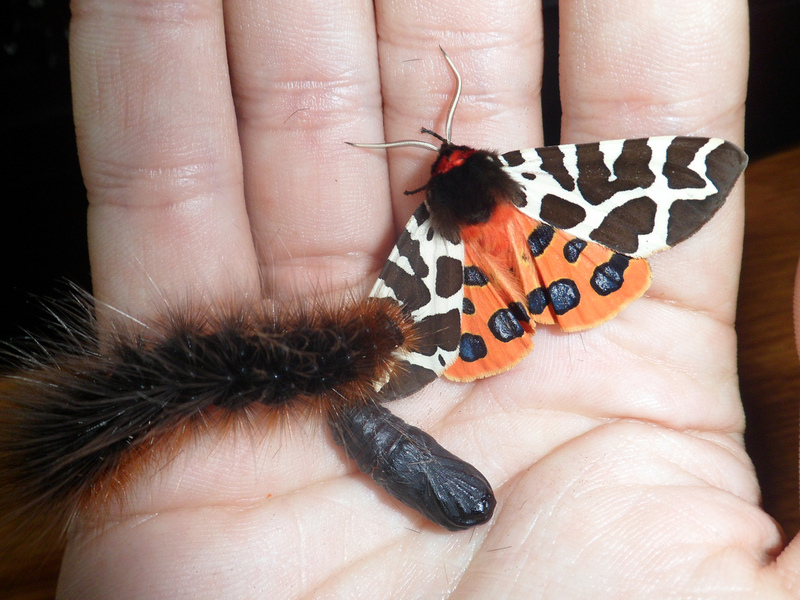 If i want to over winter the Garden tiger moth Caterpillers, where is the best place to put them? I think in my home would be too warm. Would being out on the balcony be better? Can someone help please. My garden tiger moth pupa have stopped moving. Do you think they are dead? Lepidoptera Field Guide The ultimate field guide for Lepidoptera: when users contribute pictures to the field guide, the artificial intelligence behind this website learns to recognise and identify their images automatically for users! Saturniidae World Free to use and contains pictures of atleast all the Saturniidae genera and many species. Wow, and free to use! What a wonderful website for Saturniidae.